You just love the little smile on your child’s face, and you’d do just about anything to make sure it stays strong and healthy all throughout their life. Of course, an easy way to make sure their smile stays on track is to visit their dentist in Chesterfield, Dr. Jeff Yenzer. As the father of three children, he understands better than most just how important early-age dental care really is, which is why he chose to take advanced training specifically in children's dentistry. 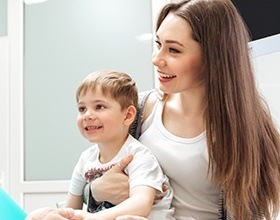 When you bring your child to come see us, we’ll make sure their smile is developing correctly, check on their teeth, and help teach them the basics of dental care to make your job a little easier at home. We recommend that you bring your child in for regular visits starting around the age of three. This will give Dr. Yenzer a good chance to monitor their dental development, and he will also be able to spot any issues or see signs that a problem might develop in the future, allowing him to intervene. Child dental care is often easier, faster, and less invasive than if you wait till later. How will you take care of their smile? We’ll give your child regular checkups and cleanings just like we do for you, plus we have more child-friendly treatments like dental sealants and fluoride treatments that can protect their teeth before the enamel fully hardens. Plus, we know that when it comes to your child, top-notch clinical skill isn’t enough. 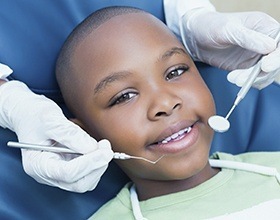 Our entire team will also go out of their way to ensure that your child always feels welcomed and relaxed whenever they come to see us so they can establish a positive connection to dental care from the very beginning. If you have a little smile at home, then we would love to help make it shine. If it’s time for their next appointment, or even their first, be sure to contact us today.